Motherboard is one of the most important components of your computer whether it is a laptop or a PC. It is the only component on which other major components are fitted or connected that includes your processor, memory, hard disk, graphics card etc. 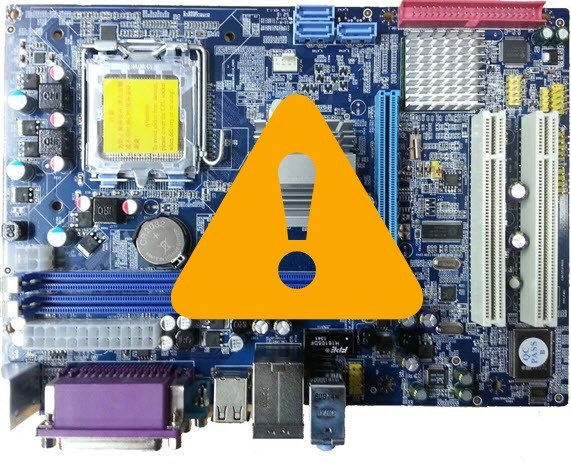 If your motherboard goes faulty then it may be possible that it can affect all the components connected to it. Detecting a faulty motherboard is a bit hard task so here I am going to list down the various symptoms for a faulty motherboard. 2 What to do with Faulty motherboard? Here are the top symptoms of a faulty motherboard in your computer. You computer may fails to boot if your motherboard is faulty. Booth failure can also occur due to faulty RAM and faulty hard drive but if everything is alright then the culprit might be the motherboard. Boot failure is accompanied with continuous or non-continuous beeps depending on the BIOS you have. So if you encounter boot failure or if your computer won’t start then it might be a sign of a faulty motherboard. If your computer freezes or hangs in the middle of your work without any valid reason then it might be a sign of faulty motherboard. Here you should inspect every component and try to find out whether the fault is with motherboard or not. If you encounter frequent Blue Screen of Deaths (BSOD) then it might be a cause of a faulty motherboard. BSOD is generally caused due to faulty hardware and drivers. So here make sure all the drivers installed are up to date and all the other hardware including RAM, Hard disk is working good without any issues. If all the other hardware is fine and you are still getting BSOD then it might be the case of faulty motherboard. If your motherboard is not detecting new or already connected components and devices even if you have installed all the required drivers then it is a clear cut sign that there is something wrong with the motherboard. You may restart your PC and check your Windows OS to confirm that the fault is with motherboard only. If the applications, softwares or programs are crashing without any reason then it might be the case of faulty motherboard. Run and Check as many applications to confirm that the problem is with motherboard only. This can happen due to faulty RAM and HDD too. What to do with Faulty motherboard? You cannot repair a faulty motherboard at home. Sometimes it is not even possible to get the motherboard repaired even by the technicians and the only choice is that you have to buy a new one. If your motherboard is in warranty then you can get it serviced or replaced by taking it to the authorized service center in your city or area. You may also checkout the important motherboard buying guides by going through the links given below. Here I have listed down all the major problems that can help you to detect a faulty motherboard and then take appropriate action. If you have queries regarding this then you can ask me by leaving a comment below. i have zenith motherboard and only first screen appears (zenith logo appears) and next screen is not coming, kindly assist. means you can’t even log into BIOS? are you using graphics card? well then may be a issue with RAM or motherboard. Get it inspected or try putting another RAM. Have you format the boot drive for installing windows or just overlapped on the previous one? Also reboot in the safe mode to see if the CPU usage is still 100%. My PC’s rear USB ports are not working in Windows OS. They are working perfectly in Linux OS and the BIOS is also perfectly detecting all the USB devices attached to those rear USB ports. I have already tried re-installing the USB drivers in the Device Manager and even formatted my PC but the problem isn’t solved. The ports don’t work even in the Windows installation setup if I boot using the Windows installation disk. I am saying this because when my USB mouse is connected in one of the rear USB ports, the mouse doesn’t work in the Windows installation setup, but it works perfectly when connected in the front USB port. Sir please help me with this wierd issue. Check your BIOS for your current USB settings and get back to me again. In BIOS, the USB 2.0 controllers are enabled but in the Windows Device Manager it is showing error in three of the USB drivers and it is saying: “Windows has turned off this device as it reported problems”. Which Windows version are you using? I also suggest you to try a different copy of Windows. The problem started just one day suddenly when I was using Windows 7 Ultimate SP1 x86. I then switched to Windows 10 Pro x64 (Creators Update) but the problem is still there. Strange. It can be a hardware issue then, but you said they were working fine in linux.